My wallet tore just as I was listening to a commercial for the Ridge Wallet. So I bought one. It's a little on the tacticool wavelength and I got a carbon fiber model. It's ultra minimalist and only holds something like 12 cards. It's really light. And it forces me not to stuff crap in my wallet. I always swore I wouldn't be like my dad with all manner of junk in my wallet but in sorting through the old one I had coupons that expired years ago and gift cards to restaurants no longer in business. It also blocks RFID if that's a concern. It took time getting used to a wallet in my front pocket but I do feel more comfortable sitting. And it forced me to reevaluate my EDC. I don't need my pistol range card all the time, I can leave that in my range bag. Things like that. $100... a little rich. Beyond that it's not easy to use. If I was the guy who used stuff in his wallet all the time this would not be the product for me. If you're looking for an eye catching minimalist wallet with RFID security this could work. I actually like the front pocket carry (more secure) and it's great for carry in shorts that really don't have space for a traditional wallet. Also really great for people like me who basically use cash and one credit card for everything. Really handy for a night on the town or fitting in a breast pocket. And while spendy I had my last wallet for 25 years. Perhaps the best part is the minimalism. I EDC so much crap already dragging around a bulky wallet was awful. Yeah a bit spendy. Some models for $72. 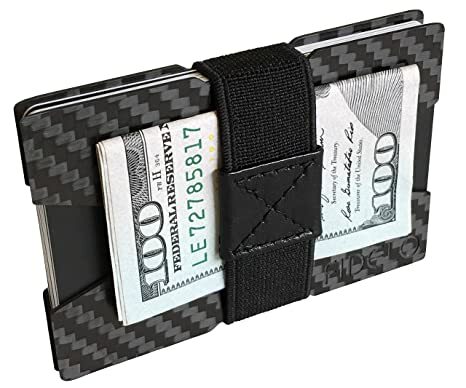 There's been so much hype on the ridge wallet that I'd never be able to get one. I just hate hype. Looks like a great wallet, but... $100??? I've been carrying one of these for just over a year and really like it. And it's just under $20.